Sorry for the long break between posts but it’s been a bit busy around here, we had a first birthday in the house ;0 for which I did lots of cooking and baking but more on that later……Now about this cheesecake… I am a sucker for all things peanut butter and chocolate related. 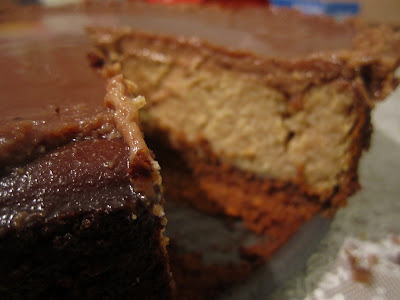 Whenever I see a blog that has a significant amount of pb-choc recipes (like this one and this one) I am hooked. 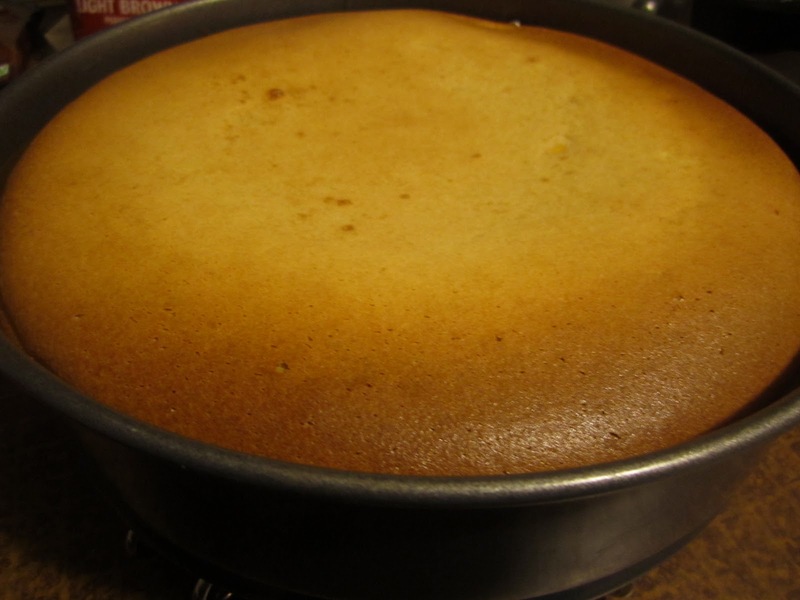 A series of events led me to me making this cheesecake. When I first saw the recipe in Nigellas’ book Kitchen, I knew I had to make it, especially when I read that it was Reasse’s peanut butter cups in cheesecake form ( I love love LOVE those). Then I saw her make it on TV with hubby and absent mindedly agreed to make it for him. Over the next few months every time I was sitting on the sofa perusing through Kitchen again (indeed Nigellas books are as good to read from as they are to cook from) he would mention it again and then recently the Kitchen TV series was being repeated on the food network so we were watching it and he mentioned again that I said I would make it for him and I was like “yes yes I’ll make it”. It would have probably taken me another month or something to get around to making it. 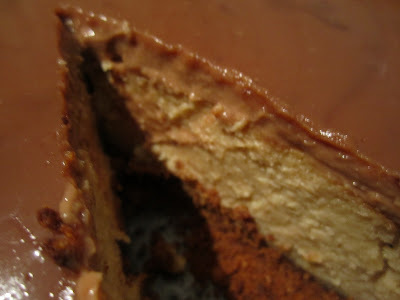 But that evening I happened to be reading a pb-choc recipe on one of those aforementioned blogs (yes doesn’t it look glorious, I don’t know what nutter butters are but I wanted to taste one immediately and I am definitely going to get around to making a peanut butter pie one of these days soon) and that post led to this sad one and this inspiring one and it made me want to get in the kitchen immediately and make the cheesecake for my husband. 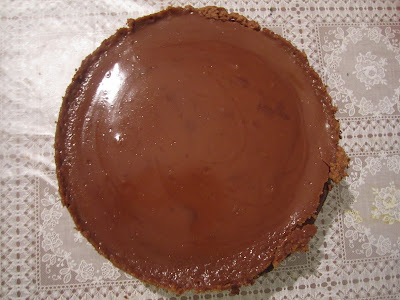 Bakerella and lots of others in the blogging community had made peanut butter pies to honor Jennifer perrillos (of In Jennies Kitchen) husband who had passed away suddenly. I loved her post titled “Another life is possible”. 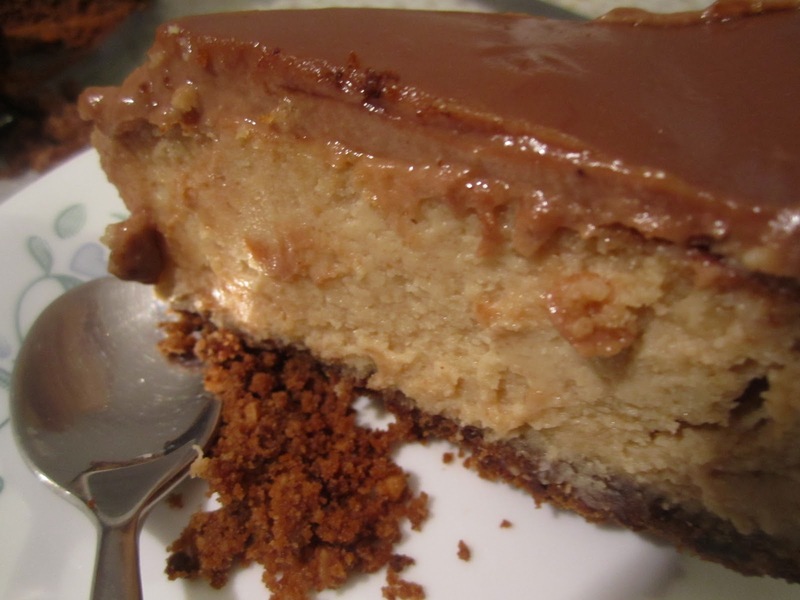 So I made it the following weekend, It did taste great but I have to say I felt it was more snickers in cheesecake form –it wasn’t Reese’s peanut butter cup enough for me. 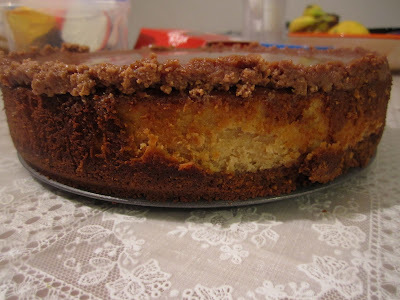 Maybe next time I won’t process the choc chips in the base-I’ll just leave them whole, you might be able to taste the chocolate in the base a bit more then as I thought it got a bit lost. I would definitely make it again it was a hit with hubby and went down well with others too. Although I have so many things on my always exciting holidays to-bake list that I don’t think I will make it again anytime soon….